Olive Garden Parmesan Crusted Chicken – make an Olive Garden favorite at home this recipe tastes alike their famous dish. In this recipe,you could make the Parmesan chicken breasts and serve them just like that, or you can add the pasta, broccoli and more and make a copy cat recipe of this dish to serve this anytime at home. Often the Olive Garden has a very seasonal menu, serving up fabulous dishes only for a short period of time. 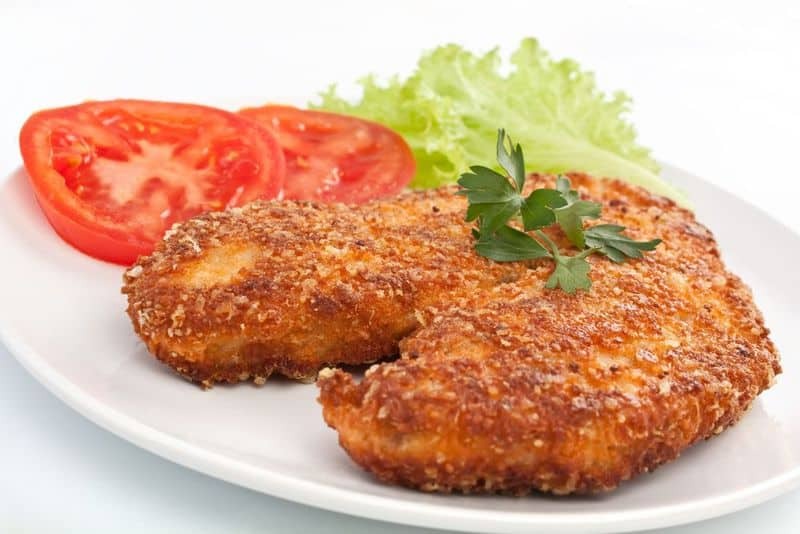 Now you can enjoy their Parmesan Crusted Chicken anytime. Olive Garden Parmesan Crusted Chicken is a great way to prepare chicken. Prepare pasta according to package directions. Wash and dry chicken strips. Mix breadcrumbs, flour, and Parmesan cheese together. Place milk in a dish for dipping. Dip chicken in breadcrumb mixture, then in milk, and then back in breadcrumbs. Place in frying pan with heated oil and fry at medium to medium low temperature until golden. Remove and drain chicken. In a saucepan on medium heat, melt butter; add olive oil. Whisk in flour until mixture is blended. Quickly add garlic, water, and 1/2 teaspoon of salt; stir well. Add wine and blend. Immediately add half and half and sour cream; stir. When the mixture is smooth, add grated cheese; stir until melted. Finally, sprinkle fresh basil in the sauce and stir lightly. Remove from heat. GARNISH: 4 broccoli florets (lightly steamed) 2 white mushrooms, quartered and lightly steamed 1/4 teaspoon crushed red pepper ASSEMBLY: Place 2 cups pasta in an individual pasta dish. Spoon about 1/2 - 3/4 cup sauce over pasta; add broccoli and mushrooms. Place Parmesan chicken on pasta and sprinkle red crushed pepper. Add grated Parmesan cheese if desired. I have had this at Olive Garden and loved it. I didn’t think I could make this at home and it would taste the same but it did! We loved it!